ILYM | What Does ILYM Mean? ILYM means "I Love You More". ILYM is a response to "I love you" (especially in the US when saying goodbye). The abbreviation ILYM is typically used between family members or between partners. It is often used in song lyrics and is also the title of a best-selling book by Laura Duksta..
Of note, ILYM can also be written as ILYM. 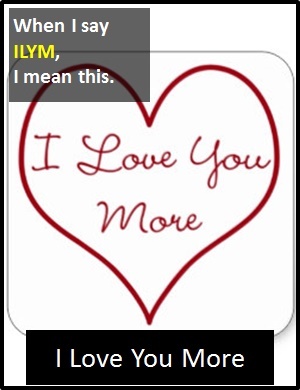 "I love you more (ILYM)" is a typically American response to "I love you". Daughter: Bye mom, I love you. ILYM is an initialism abbreviation. Technically, this means it is pronounced using its individual letters (i.e., Eye Ell Why Emm), but as this is harder to say than "I love you more," it is not often uttered using its letters. In other words, the abbreviation ILYM is for efficiency in writing and not efficiency in speech.